The scream was so shrill this morning that, for once, I couldn’t quite tell from which of my children it emanated. I had just stepped around the corner to file a broken fingernail—leaving our gyroscope for a moment in the middle of the floor—when I heard the scream followed by the sound of two pair of feet running one after the other. I came around the corner only to see the drapes fluttering wildly and the lamp behind the wing chair tottering precariously as a child’s body edged past it in a rush. Evidently the gyroscope (I deduced from the scene) had become an object of competition between my two children. Who would hold it? Whose turn was it? Give it to me. Give it to me. Gimme! As the parent of siblings, I am in the process of teaching them how consciously not to compete with one another. Not just for my own sanity. And not because I deny the human adaptation mechanism of competition. At its heart, competing with a sibling does not make long term sense, even if we are wired up to do it when we’re young. I explain to our children how our love for them is an infinite resource, how we share most everything together in the house, and so on. There is no reason to compete with each other, and nothing for which competition is required in order to gain. We emphasize their talents, and we teach them to celebrate each other when one accomplishes something. The achievements of one do not diminish the achievements of the other. If only everyone in the world could understand this, what a better world we could be in. We are all better off—we, as in the universe, the cosmos understanding itself—are better off when people work hard, are productive, and achieve. We might have to compete for mates, job positions, spots on a college campus, and various other finite resources; yet, sadly, all too often, I see a trend in our culture to compete for those accomplishments which have no bounds. Happiness. Love of children and/or spouse. Health. Laughter. Adventure. All of those qualities are forces that, in my way of thinking, only increase for everyone the more we achieve them. Your happiness makes me happy. The time you spent creating magic makes the universe a better place. That adventure you had? So cool! It inspires me to try that! But my children still have the untrained minds of the young. Untrained and unmastered, they are still prone to jealousy. They have no idea how to rule over their competitive natures, or how to master and channel that energy into productive competition with themselves. They have yet to choose which kind of person they will become: 1) the kind of person who becomes bitter, jealous, and insecure at the achievement of others or b) the kind of person who becomes inspired to work harder, to believe more in themselves through seeing what is possible, and who aims at self-improvement by witnessing the achievement of others. At some point, we make a choice. If we don’t actively choose, the default is the juvenile mind. I’ve always had a tendency to turn my competitive nature more inward anyway (except for in soccer and Mock Trial, activities that channeled competition in a productive way), but an epiphanal point for me had to the the first section of one of the first classes of my freshman year at Stanford. Western Civ. We had hundreds of pages of reading due for that first meeting of section alone, not to mention hundreds for other classes. First up: Virgil’s The Aeneid. It was a Thursday afternoon. We parked our bikes, assembled in the classroom, all of us early (I mean, it’s Stanford, yo). We sat around in parliamentary fashion, all seeing each other. First college section, ever. There were nerves. Except for the young man across the way. He hadn’t even unwrapped his course reader yet. Holy cow, what? He didn’t READ for class?? To put a finer point on it, he starts talking about how he went to a huge party the night before. He hadn’t studied for this section at all. A few follow up questions later, and we learn: oh, The Aeneid. Yeah, I read that in high school. In the original Latin. I’m not worried. Yeah. You learn fairly quickly in such an environment that there are things people are going to do better than you can, just as there are things you will be able to do better than most others. And then you learn: it doesn’t matter. Not really. Sure, if you are the kind of person who cares only about grades or how things look, maybe it does, to a point… But I discovered that my love of learning for learning’s sake and for the honor of working hard will almost always outpace a grade monger. Why? Because to work hard for an extrinsic reward, or for any system of rewards and punishments for that matter, is superficial and inauthentic. Extrinsically motivated people usually peter out. People who compete with others instead of with themselves also usually tire out or give up. A person who competes with only herself to be better than she was yesterday works from a powerful place of inner authenticity. She is in touch with, and in tune with, herself. There is no reward big enough to convince her that she has earned the right to stop working; there is no punishment or failure that can truly set her off course. So she keeps going. She does not waste her time, and therefore limit her efficiency and efficacy, considering other people’s success as compared to, or contrasted with, her own. She works for herself. She is the toughest master to please, but the big advantage is also that she does not become distracted and preoccupied with what others think of her. She does her best for the sake of doing her best. Runners know how to channel the competitive nature. In some ways, I was always meant to be a runner. Bill and I talk often about how I could not have discovered the runner mindset before now. I had the runner’s mindset toward my academic life from an early age—how could I not have gravitated toward distance running? My mind and my life philosophy are made for the sport. Runners know: we compete with only ourselves. With ourselves, and of course, with Time. Time is the absolute standard. 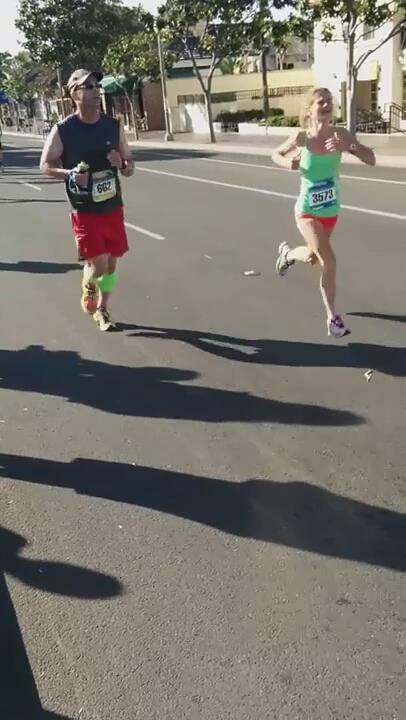 It is why we can be crying tears of joy at coming in 5th: we see our personal record as we cross the finish line, or as it is often called now, our personal best. Personal best. Personal. What is my personal best? In this life bounded by Time, by the clock, what is my personal best? With my husband? For my kiddos? As a daughter? As a teacher? As a runner? As a thinker? As a creator? As a citizen? As a person who is passionately alive? How will I challenge myself to be better than I was the day before? How will I work harder than I did? How will I wake up today and be a more loving wife? A more engaged and creative mother? A more giving daughter? How will I work better at keeping my house cleaner? What will I do today to inspire myself to work on some tedious chores with a joyful heart? How will I be better in charge of myself? What healthier decisions can I make today? I never let up. Each day is new. The clock is ticking. What is my personal best? How will I work harder? Funnily enough, yesterday my dad left a little stack of things that he must have taken out of the cubby hole of his old desk. There was a little paper I had written on in there, along with some other items. I had written, in my elementary school handwriting, “Relaxation is not a sin.” I don’t really use the word “sin” at this point to describe parts of life, but I did do a double take. I am still thinking about this message from my past self. All I know is that I am obsessed with my best. I am obsessed with achieving honor through hard work for hard work’s sake. Other people are not my competition. The life clock, is. When I race, I feel love for the other runners around me. I know what they give, you see. The people that beat me? My heart thrills for them. I feel no rivalry. They are beautiful, in my eyes. It’s me and the clock. Those with trained minds who are self-masters will understand what I mean; anyone else will think I am not telling the truth here. Yet it is the truth: the people ahead of me inspire me. Why? Because they make me feel HOPE. If they can do it, why not me? I don’t feel defeated, bitter, insecure, or jealous. If they can do it, why not me? If I train more, why not me? They show what the body is capable of doing, with hard work. If Maria Kang can do it, why not me? If amazing Elf on the Shelf mom can do it, why not me? If all those Pinterest moms can do it, why not me? I am just as capable as anyone else. Those kinds of inspirational people give me hope, because I believe fundamentally in my own abilities, too. Human achievement gives me hope. We can only keep making ourselves better, our lives more joyful and abundant. Right now I am focused on the next phase of my training. I hit my first 40 mile week last week (actually, 40.92, the kind of number that makes a compulsive person like me want to scream), and I did 35 this week. Many marathoners train at much higher mileage, but my first marathon is at least another year or two out. I want to get to the point of being able to run it in 3:00.00 or so. But interesting to note that a marathon is now a foregone conclusion, when for so long I was resisting the bug… I still think I have only one in me, and if so, I want to set performance goals for it that can motivate me to work on speed at lower mileage in the interim. However, I may have more than one in me. I sure would like to see Boston someday… 🙂 The week I did 40.92, my average pace for all those miles would have had me at a 3:13.00 marathon pace; however, I doubt I could quite run that now since I need endurance without rest breaks in between! Coach-Husband has started me on twice daily runs to ramp up mileage, and I am also routinely running intervals on the yard track locally, both 440s and 220s. Bill has already forewarned that a series of 880s are comin’ my way, but you know, I have really developed a love for the track. My roads will always be my preference, but the track is consistent and predictable and can be a place really to assess and measure progress. The objectivity of track work has me hooked. I do not fear objective measurement, and I have come to believe that objectivity is the key to losing/maintaining weight and making progress athletically. As far as that goes, my weight and BMI are both in the healthy range (despite what a few well-intentioned friends have expressed concerns about), and in fact, according to stats from Runner’s World as posted online at Let’s Run, I am the average height/weight for world class adult female marathoners. My body found its set point, and although I do vary within about three pounds, I am where I should be. More muscle mass would be nice, but I am definitely lean. I do appreciate the people who have asked about my body image, and I did start to doubt my leanness a bit more in light of their questions…until I went to the Carlsbad 5000 and saw many athletes who look similar to me. But: I eat, I keep all of my food down, I eat with running in mind (not too little, but not overboard either), I am not overly stressed by fluctuation, and I look at long, long term goals. I just look so very different from how I have looked my whole life that I think it takes people aback a bit. My goals are mainly athletic at this point, and I eat what I should in order to be attacking those goals as well as I can. I did eat more the past couple of weeks, and I am in my weight range even after running many more miles than I normally do. My coach is always checking up on me, too, to make sure I am where I should be. I rely on plant-based proteins mainly, as well as eggs, and occasional chicken and fish (I have not had beef since Christmas—it just doesn’t sound appealing at this point). Fuel and training go hand-in-hand. I do inadvertently drop low once in awhile, but I always get my weight back up to where I should be. If I add more weights or harder training, I often have adjustments to make. So I thank the people who have gently and privately inquired about my health: I really am on top of it and have no plans to get carried away with any more weight loss. I have actually maintained my range now since the summer, which has been my plan. 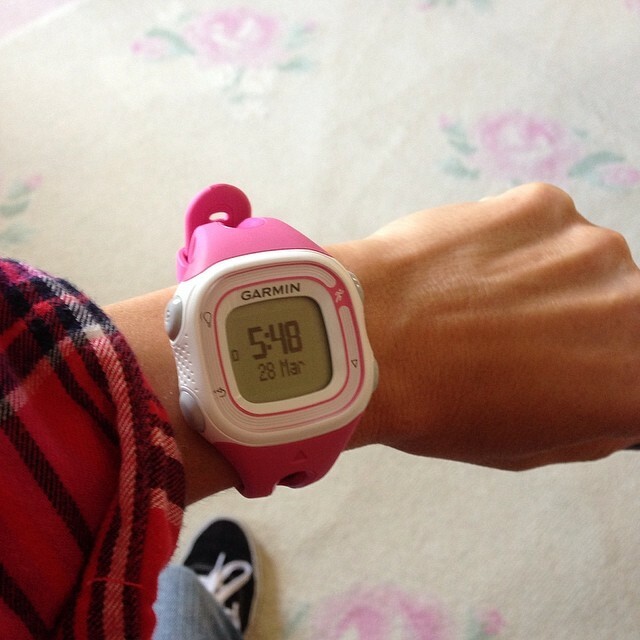 My coach-husband also recently gave me a Garmin Forerunner 10 as a present, and I think it has enhanced my training substantially. I can now pause at stoplights to get a better read of my time, and the virtual pace setter keeps me on task. I have been seeing more and more sub-7 miles lately, but we have a ways to go before that becomes the norm. Still, I am seeing them. I use both my Garmin and my GPS app on my phone to double-record the data. When I get home, I debrief with Bill before he goes to work and keeps all the data from both devices in a spreadsheet. He uses tables and mathematics to determine my training tasks and intervals. So far, I have been able to do everything he has asked. I loved that Schumacher, her coach, said, “as well as anybody in the world.” Not “better than anybody in the world,” but “as well as.” That’s just exactly my point about the nature of competition. The runner’s mindset is to want everyone to do well, everyone to do his or her best. We want others to do as well as they can possibly do, because that is pure sport. No one loses anything when others achieve, or when others work hard to achieve. In fact, I am so far away from the rivalry mindset in life that I cannot begin to understand it. These elite runners and these coaches understand that so much of making a life meaningful is about fulfilling oneself as a person…by working hard, and doing one’s own best. What if everyone approached life that way? It is a powerful, and hopefully empowering, thought.